Blakeney Boutique Cottages provides luxury holiday accommodation for the discerning guest who is looking for comfort in a tasteful, relaxing environment. Being a family run business for over 13 years, with all three cottages owned by the family, we ensure you have everything you need to make your stay as special as possible. As all three cottages are a few steps from the quay and in the same courtyard, all three cottages can either be booked separately (sleeping 8, 6 and 4 guests) or altogether to accommodate 18 people. 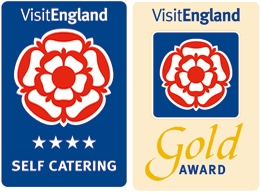 We are proud that Benbow Cottage has been awarded a 4 star VisitEngland AA rating. In recognition for high achievement and exceptional quality, we are delighted to have been awarded a Gold Award in 2013/14/15/16/17/18 and again in 2019. Ship Cottage and Stable Cottage are not assessed by VisitEngland AA but are decorated and managed to the same exceptional standards. Please email me to make a booking if you cannot find what you are looking for. Many thanks. We have been featured in The Sunday Telegraph 'Stella' Magazine by well known journalist Lucy Cavendish on 28th July and 4th August 2013. We were also featured on Lucy's personal website (Summer 2013). Care has been taken to ensure every need is catered for so that your stay is as special as you are. Top quality linen and towels are provided, as are luxury toiletries. On arrival you will find basic essentials such as milk, tea, coffee, Tassimo coffee and a bottle of wine to settle in with. We also provide a welcome pack from the Blakeney Deli which includes wonderful crusty bread, butter, local jam and cheese. We also provide local apple juice when available. Firewood, kindling and fire lighters are supplied for the wood burners between October and March.